Sell EBS retail brands, and we’ll invest in your success with a discount on pro-use styling and finishing products every time you place an order. You save money up front; your stylists sell more retail; your clients leave with a bag full of beautiful. Everyone wins! Ask My Rep to Save Me Money! Simply place your retail order directly with your EBS salon coach. 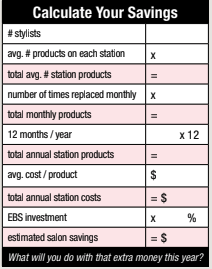 Based on the size of that order (see chart), your salon coach will tell you what discount you earn on station-use products that day. Then, you order the products your staff needs. We sticker those products and pack them right into your order. No counting points, no waiting a month or three months for your products. Instant gratification, instant savings. This program is in addition to other manufacturer rewards programs. Yes, you can double-dip at EBS! Discounted products are stickered "for station use only" and may not be retailed. Selling discounted products disqualifies the salon from future pro-use discounts and manufacturer rewards programs. Discounted products are never offered for previous orders, so make sure you order your discounted station-use products with every retail order. Order directly with your EBS salon coach only. This program is not offered with orders phoned into our warehouse call center. Only styling and finishing products are offered through this program (including leave-in sprays, oils and serums), no backbar. You may order discounted products only from retail brands that you carry and order that day. *Actually, there is a limit of one of each product per stylist each qualifying order. Intro orders that include free products do not count in purchases for rewards.